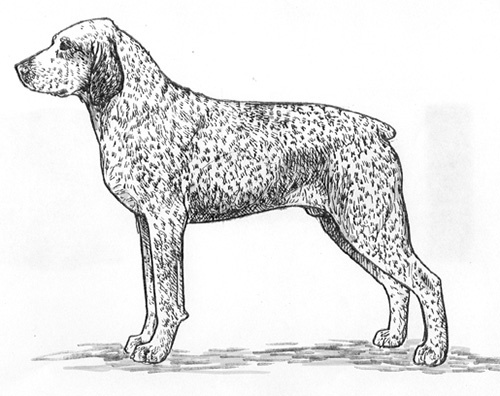 An ancient French pointing dog, first described by authors in 1598 as a pleasant companion of the hunter. In the early 1900s breeders attempted to introduce a new, faded lilac color to the breed and to produce natural bob tails. These fads put the existence of the breed in danger, but today the breed is in good hands. A medium sized, short haired braccoid type dog, compactly built, muscular and robust. He gives the impression of strength and power, without excluding a certain elegance. The female is less stocky and more elegant than the male. A kind and affectionate companion as well as a passionate and intelligent hunter, suitable to a variety of game and terrain. The pear shaped head is an essential breed characteristic. Seen from every direction, the skull is round. The lateral sides are rounded, and the zygomatic arches are well developed. The planes of the top skull and muzzle are parallel or very slightly divergent towards the front. The stop is moderately defined. The muzzle is slightly shorter than the skull. It is strong and broad at the base, tapering slightly towards the tip to form a truncated cone shape. The bridge of the nose is straight or slightly convex. The lips are not too thick, the upper lip covering the lower lip without forming too much of a fold at the corners. The edges of the lips are well pigmented. The Braque Du Bourbonnais has a complete set of evenly spaced, white teeth meeting in a scissors or level bite. Disqualification: Undershot or overshot, lacking contact of the incisors. The nose is broad, with well opened nostrils. It sometimes protrudes over the perpendicular line of the lips. It is fully pigmented, and matches the coat in color. Large and fairly round, with an intelligent, kind expression. Hazel or dark amber in color, depending on the coat. The eyerims are fully pigmented. Medium in length, reach to, or beyond, the throat. Rather broad at the base, and attached at, or slightly above, eye level. Hanging naturally against the cheeks, flat or slightly curled inward. Well muscled and with good reach, but not too long. A slight dewlap is tolerated. Very muscular, with oblique, close fitting shoulder blades and a rather long upper arm. Straight and muscular, well boned but not coarse. The elbows fit close to the body and the pasterns slope very slightly. The body is square or slightly longer than tall in proportion. The chest is wide, long and deep, reaching to, or slightly below, the level of the elbow. The depth of the chest is approximately one half the height at the withers. The withers are well defined, and the topline is straight and strong. The loin is short, broad and muscular. The croup is rounded, moderately oblique, with powerful muscles. The underline is progressively rising, and the flank is flat and only slightly raised. The hindquarters have strong bone with very apparent musculature. The upper and lower thighs are long, and there is good angulation at the stifle. The hock joint is strong and well angulated. The rear pasterns are short and vertical. Round or oval, with thick pads and tight, well arched toes and strong nails. No dewclaws. Disqualifications: Presence of dewclaws, or evidence of their removal. Either natural, docked short or a natural bob tail. If natural, the tail should be held below the topline when the dog is standing. Fine, dense and short, though sometimes a little coarser and longer on the back. On the head and ears, the hair must be finer and shorter. White, with fine brown or fawn ticking. Overall roaning is also accepted. Solid patches of color are accepted only in small numbers and sizes. Serious Faults: Coat with too large patches of color. Heavily colored (patched) head. Disqualifications: Any black in coat. Any color other than described in the standard. Height for males is 20 to 22.5 inches at the withers. For females, it is 19 to 21.5 inches. There is a tolerance of one half inch in either direction. Strides of average reach at the trot. When hunting, the gait is a sustained gallop, balanced and supple. More than 1.5 inches over or under the standard. Undershot or overshot, lacking contact of the incisors. Presence of rear dewclaws or evidence of their removal. Any color other than described in the standard.